!! 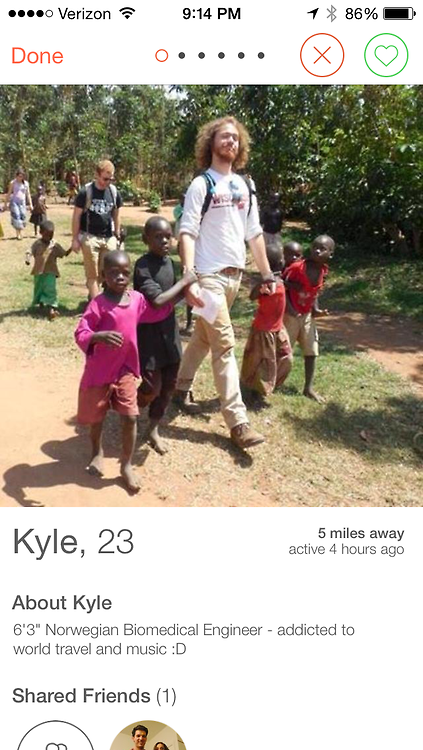 OMG, move over ‘Grindr Remembers’: Discover Tinder’s new photo trend with ‘Humanitarians of Tinder’ Tumblr !! “Grindr Remembers The Holocaust” was the first socially-aware-to-make-me-look-good-on-a-dating-app trend to make its way to the dating apps for gays — and now the straight world want a piece of the cake with their new dating app trend “Humanitarians of Tinder”. The trend which The Onion called out and really put best back in January with their article 6-Day Visit To Rural African Village Completely Changes Woman’s Facebook Profile Picture has swept Tinder, and someone has created a great Tumblr which documents the best of. Check it out here! Be the first to comment on "OMG, move over ‘Grindr Remembers’: Discover Tinder’s new photo trend with ‘Humanitarians of Tinder’ Tumblr"